U.S. Navy Sends Hospital Ship To Colombia To Treat Venezuelan Migrants : Goats and Soda The USNS Comfort spent a week in the Caribbean caring for ailing Venezuelans who couldn't get treatment in their troubled home country. 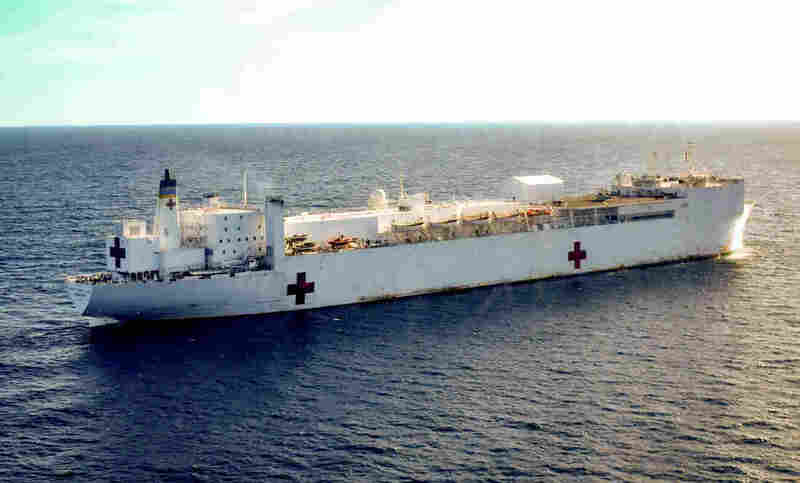 The USNS Comfort, a U.S. Navy medical ship, floats off the coast of Riohacha, Colombia. The medical vessel is on a four-country tour of the region, providing medical assistance. 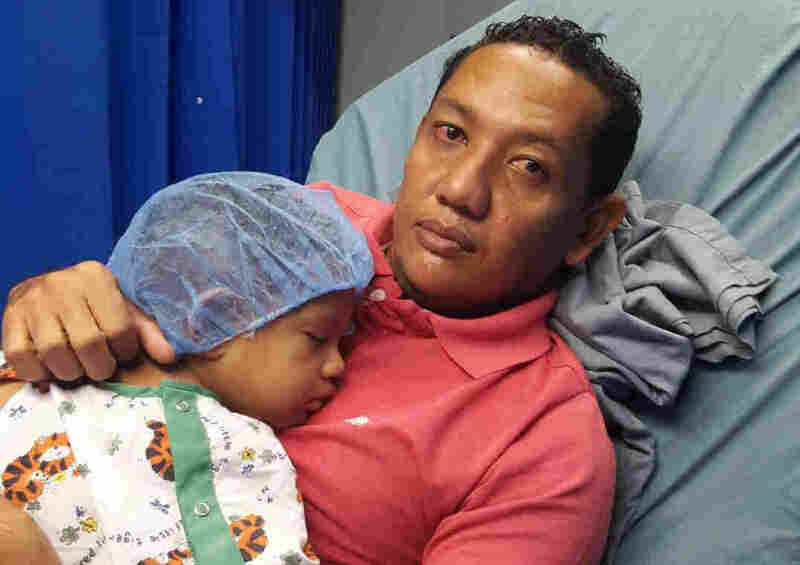 For Daniel Pérez, a Venezuelan bus driver, getting surgery to remove his gallstones turned into an excruciating, four-year odyssey. He hit one dead end after another in crisis-wracked Venezuela where hospitals lack everything from doctors to antibiotics. In February he emigrated to Colombia — only to discover local health clinics jammed with Venezuelan migrants. All the while he had to sleep on his left side due to the pain. Pérez finally found relief last month through an unlikely benefactor: the U.S Navy. "This is a blessing," said Pérez, 33, shortly before undergoing gall bladder surgery aboard the USNS Comfort. 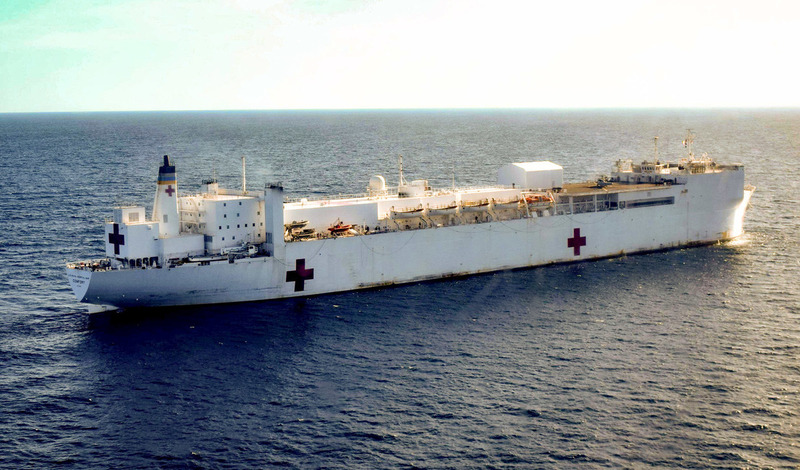 Painted white with huge red crosses, the 10-story-tall, 895-foot-long Comfort is a former oil tanker that's been converted into a floating hospital. The Comfort treats injured soldiers during wars but is also deployed to disaster zones, like Puerto Rico after Hurricane Maria last year and New York Harbor after the Sept. 11 terrorist attacks. In late November, it spent a week off the Colombian coast near the border with Venezuela. Its main mission was to provide temporary backup for Colombia's health-care system that, especially in border regions, has been overloaded. That's largely due to an influx of more than 1 million Venezuelans who have fled to Colombia amid food and medicine shortages, hyperinflation and a government crackdown on political dissent. Navy doctors and nurses treated minor ailments in the coastal town of Riohacha but getting surgery patients to the ship required some logistical gymnastics. Due to a lack of port facilities in Riohacha, the Comfort was stationed 15 miles off shore in the Caribbean. Patients donned helmets, goggles and life vests and were strapped into the back of Black Hawk helicopters for the short flight to the ship. Once below deck, it was hard to distinguish the Comfort from a normal hospital. Hallways were jammed with gurneys and boxes of medical supplies. Surgeons worked from 12 operating rooms positioned near the center of the ship to minimize the rolling effect of ocean waves. All told, medical personnel provided free treatment for nearly 5,000 patients (most of them on shore) and performed 116 surgeries for everything from cataracts to hernias to foot defects. Santiago Efer, 2, and his father, Francisco, in the The USNS Comfort. 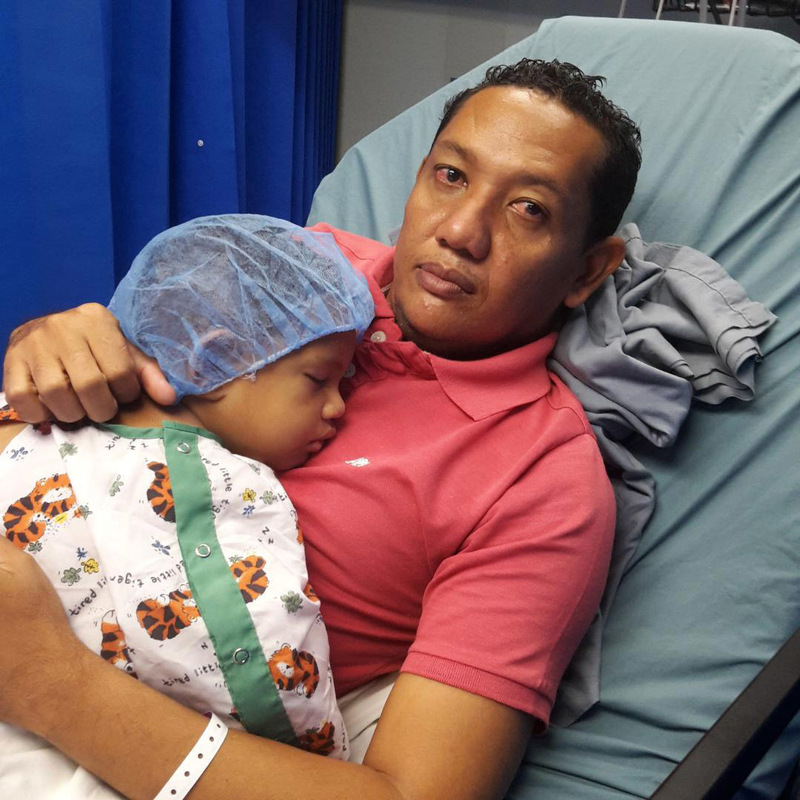 Surgeons treated Santiago for an umbilical hernia and an undescended testicle that was lodged in his abdomen since birth. One of their patients was two-year-old Santiago Efer, who since birth suffered from an umbilical hernia and an undescended testicle that was lodged in his abdomen. His father, Francisco, fled to Colombia in April after he was unable to secure treatment for his son in the Venezuelan city of Maracaibo. "There were power outages in the operating room and no air conditioning," he said. "The clinic kept deteriorating. You can't live in Venezuela anymore." Venezuela is rich in petroleum and holds the largest oil reserves the world. But critics accuse the country's socialist and increasingly authoritarian government of squandering the wealth through corruption and misguided policies. The IMF predicts Venezuela's economy will contract by 18 percent this year and that annual inflation could hit 1 million percent. Among the hardest hit sectors is health care, says Rafael Gottenger, a Venezuelan plastic surgeon who immigrated to Miami and volunteered for the medical mission. He said cases of tuberculosis and malaria, diseases that had been largely eradicated in Venezuela, are skyrocketing. He relocated to Miami 20 years ago but has been back and forth. "HIV patients are dying because there is no medication to treat HIV. Cancer patients have no cancer medication," he said. Gottinger belongs to the Venezuelan American Medical Association, which is based in Miami and is providing 14 Venezuelan doctors and nurses for the Comfort's mission. They include Ariel Kaufman, a urologist who moved from Caracas to Miami four years ago. He says that working aboard the Comfort is a way to reconnect with his homeland. "It's the best feeling," Kaufman says before scrubbing in for surgery. "Nothing fills our heart more than helping these patients. Even with a small surgery, with touching their hands, holding them. It's an amazing experience." Geopolitics are also at play. The U.S. and China are competing for influence in South America, and the Comfort's mission came just two months after a Chinese hospital ship, the Peace Ark, visited Venezuela as part of an 11-nation tour. The Comfort's mission – its sixth to Latin America — ends this month in Honduras after stops in Peru, Ecuador and Colombia. "We are doing this from a sort of a hearts-and-minds standpoint" said Amanda Antonio, a U.S. Navy doctor. "We're trying to show that the American military cares about these people down here."